Might hypnosis emulate a dance? Trance can happen quite easily. Just notice right now… are you becoming more absorbed and curious? Let’s get a bit more serious. A worry grew inside me that was embarrassingly confidential. How well my IMAGES salutation to Membership would turn out. So…what am I supposed to say in my first IMAGES article to you? Here is my attempt, so please do not eschew. I placed myself in trance… and allowed the process to ferment. And now I wonder, as you read this, are you yet in a trance? Don’t think too hard, just let your experience enhance. Through breath, through sensory enlistment, and even poetically. You may notice some suspension. Has this “reading trance” already given you a perk? And notice your response as your eyes proceed. An experiential component cannot compare. And in turn, you’ll enhance your patient sessions. By taking in everything good, almost like osmosis. Is it trance? Or comfort? Or healing? Or hypnosis? All while helping self and others in duress. Since hypnosis helps us connect and to nourish. Just how easily you can grow? I learn new skills for trance and reframing. So as you read these words, take note of your state. Have you settled? Or focused? Or begun to activate? Inviting trance enhances treatments that won’t go wrong. In closing, I hope to see you at future events without hesitation. Remember, the primary goal of MSCH is to provide quality hypnosis education. Phew! I got through my first presidential salutation. I feel much better, even a bit of elation. On a more serious note, I am grateful to all of the wonderful, talented practitioners who are MSCH members…all of you. Our membership is thriving. We have grown our membership volume between 2018 and 2019 by 18% and our numbers will continue to climb this year. It is an exciting time to belong to MSCH and to know how to skillfully use clinical hypnosis with patients…because it works! I regularly see patients in my office who have spent large amounts of money and undergone many unnecessary or unhelpful treatments while searching for relief. Their treatments have included intrusive medical procedures and multiple failed surgeries. Hypnosis has now been offered, and it has given these patients relief by allowing their mind and body to re-train. Through hypnosis, these patients have accessed their own innate capacities to reframe, grow, and achieve healing of mind, body and spirit. I cultivated my own skills in hypnosis by actively attending MSCH trainings and membership, and you will too, if you have not already become a regular workshop participant. I personally do not know of a better place to receive ASCH-approved local training in clinical hypnosis than here at MSCH. I continue to be very grateful and impressed with the amazing talent of our local presenters, and our ability to attract nationally recognized speakers. I’d like to thank our workshop presenters from recent months, as we have had outstanding workshops with excellent turnouts from both members and non-members. FYI, we are experimenting with opening up our monthly trainings to non-members. While the price for non-members is significantly higher than for us members, we are capturing the curiosity of new professionals, and as a result, we continue to grow. I’d like to thank Dr. Suzanne Candell for her outstanding presentation in September, “Getting Better at Crafting Suggestions.” Even the title of her workshop was a helpful suggestion! Attendees at all levels from beginning level to advanced practitioners reported learning new skills to enhance their professional practice. 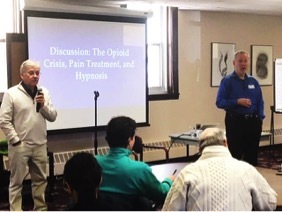 I am also grateful for the stellar presentation in October given by the dynamic team of Dr. Al Clavel and Dr. Mark Weisberg, “A Proactive Response to the Opiate Prescription Crisis.” Their timely topic was well received by attendees from many professional circles and provided several rich experiential opportunities for us all to grow our skills using enhanced mind/body techniques. Jennifer Stoos, M.A., presented in November, demonstrating her very capable abilities when treating couples at her workshop titled, “Hypnosis in Couples Therapy.” Attendees were delighted to benefit from her wide range of unique skills when working with dyads. In the future, you can look forward to our upcoming January 2019 workshop. By popular demand, we are bringing back CathyAnn Beatty, M.Div. She will give us even more skills and information on “Interplay” which helps clients unlock ‘body wisdom”, thereby unlocking parts of themselves they have psychologically buried over time. Her workshop will be a launching ground for continued structured small group consults she will offer as follow ups to the session for all interested parties. February 2019 will feature Dr. Ralph McKinney, one of my favorite MSCH past-presidents. He will present a “Deep Dive into Ideomotor Signaling.” Ideomotor Signaling is a wonderful tool that can assist in bridging the unconscious mind with the conscious mind, and Ralph is masterful in his teachings of this technique. March 2019 welcomes all of you to San Antonio, Texas to enjoy the Annual American Society of Clinical Hypnosis (ASCH) workshops. You will be able to cultivate skills from a variety of enticing topics taught by nationally known experts in hypnosis. For more info: www.asch.net. It is always nice to see the strong presence of Minnesota at ASCH annual workshops, as we at MSCH are known at the national level due to the talent of licensed health care clinicians from Minnesota. 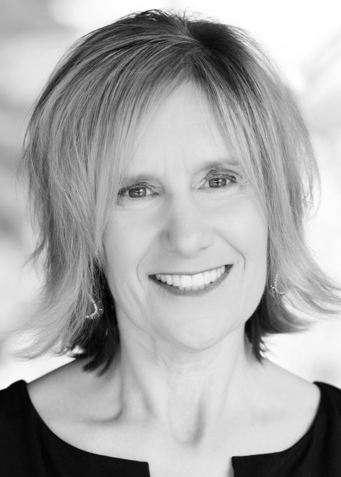 In April 2019 we will welcome spring weather and Dr. Jill Strunk, where she will provide us with insight into “Hypnotically Enhanced EMDR: Skills to Improve Outcomes.” We are delighted to have Jill join us for this full day training. We will culminate our fiscal year from June 13-15, 2019 at our 48th Annual MSCH Workshops, which traditionally feature: 1) The Fundamental Skills Workshop (for beginners and anyone who wants to attend Fundamentals again—I have attended Fundamentals multiple times and always learn new skills—and 2) The Intermediate/Advanced Workshop featuring Dr. Gary Elkins, who will address topics interweaving Mindfulness and Hypnosis: Experiential Exercises. Details to follow soon. I hope you enjoy reading this wonderful edition of IMAGES as much as I have. And, remember we are always looking for members who are willing to help out by doing random tasks that help the board to keep moving forward. If you are interested on serving on the board or on a committee, please let me know at c.bemel@comcast.net. Would you like to be part of making MSCH an exciting and enjoyable community for learning about hypnosis and mind/body healing? If so, we want you to reach out and let us know. Our Education Committee needs you to help with planning and executing the Saturday morning workshops, as well as the Fundamentals and Advanced Workshops each spring. If you’re interested, please email Cheryl Bemel at c.bemel@comcast.net. Thanks! Gary Elkins will be the Annual Workshop Presenter in June 2019. A big thank you to Randi Born, a member of our education committee, for passing on this little treasure! Gary Elkins has a new book out and the publishing company has provided a sample chapter. We hope this sparks your interest in the next annual workshop! Click to read Sample Chapter. Past Presidents, David Wark and Delle Jacobs celebrate with current President, Cheryl Bemel! Megan, Carol and Julia have joined our board! Carol is a clinical psychologist in Minneapolis who sees parents and young children in her private practice. Her primary clinical focus is parenting and issues encountered by parents with complex histories, such as abuse, neglect, foster care, and adoption. Carol is a consultant to clinicians and home-visiting programs around the state and offers trainings on infant mental health, parent mental health, home-visiting, trauma, attachment, high-risk families, and reflective practice. She teaches in the Infant and Early Childhood Mental Health Certificate Program at the University of Minnesota and is endorsed as a Clinical Mentor (Level IV) in Infant Mental Health through the Minnesota Association of Children’s Mental Health. Megan is a nurse clinician, educator and program lead at the University of Minnesota Masonic Children’s Hospital in the area of integrative health and healing. She obtained her doctorate from the University of Minnesota in 2013 with a focus in integrative health and healing. She has been practicing integrative nursing in the areas of hematology, oncology, and blood and marrow transplant for nine years. She has experience working with both adults and children to palliate symptoms during and after cancer treatment. Dr. Voss has additional training and interest in the areas of nutrition and supplements in oncology, mindfulness, clinical hypnosis, and Reiki. She teaches the Center’s graduate-level academic Wellbeing and Resiliency for Health Professionals course to working health professionals. Julia’s approach to psychotherapy has evolved and grown over her twenty years of practice. Julia trained in clinical social work/psychotherapy. 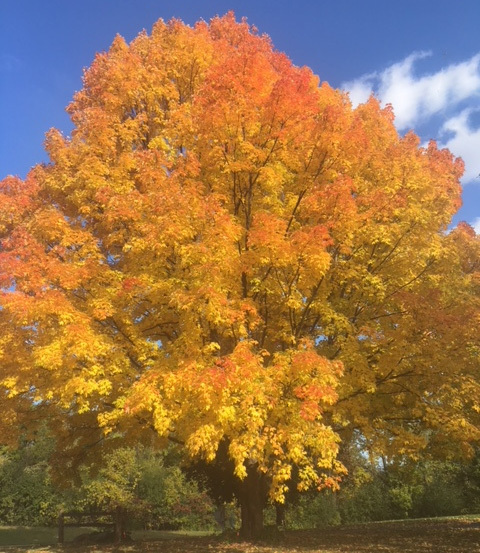 With that as a solid foundation, she has incorporated many supporting techniques, methods, theories and mindsets – each informed by her own personal experiences with healing, suffering, searching and deep exploration. Four of the most important techniques that Julia weaves together in her approach are Hakomi mindfulness-centered somatic psychotherapy, clinical hypnosis, clinical intuition, and Accelerated Resolution Therapy (A.R.T.). Past president, Al Clavel, welcomes our new president, Cheryl Bemel! Cheryl presented Al with a shovel on behalf of the board to thank him for all the hard work he has done for MSCH. The shovel also serves as a practical reminder for Al to be safe when he works at home! 2018 Daniel P. Kohen, M.D. The Kohen award recognizes outstanding leadership in the clinical practice, teaching, and utilization of therapeutic hypnosis. 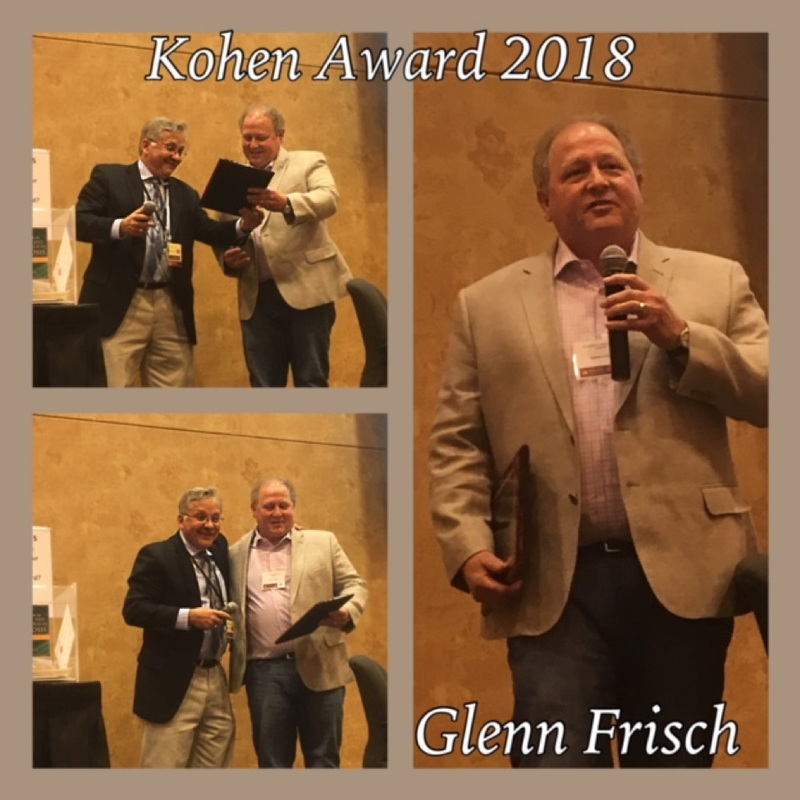 Congratulations to Glenn Frisch, DC 2018 Kohen Award recipient! The 47th Annual Hypnosis Workshop occurred June 7-9, 2018, and this year’s workshop addressed a wide range of both clinical topics and social issues pertinent to the challenges and opportunities emerging within both society, and the clinical setting. The advanced workshop began with small group seminars, which provided participants the wonderful opportunity to learn concrete skills for several specific clinical issues including sleep disorders (Dr. Kevin Harrington), prescription opiate crisis (Drs. Alfred Clavel and Mark Weisberg), challenging emotions (Dr. Suzanne Candell), and advanced hypnosis techniques (Dr. Ralph McKinney). The primary focus of this year’s annual workshop was the intersection of hypnosis with gender and culture. Dr. Julie Linden provided an eclectic and exciting perspective on Hypnosis is for Everyone: Tailoring for Gender and Culture. Her wit and wisdom covered an exceptionally wide list of topics related to gender and culture such as grounding, development, identify, trauma, gender, and clinical creativity. Throughout the workshop, participants were met with Dr. Linden’s holistic and witty approach to gender and cultural issues, and she frequently offered a unique retrospective view of the field over a long and prosperous career. From personal anecdotes to stories of resilience from her international experiences, she provided the audience with a balanced perspective of the personal and professional. 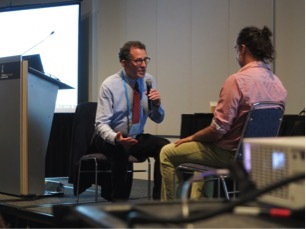 Dr. Linden also used the power of language – “every word is connected to experience” – to guide the audience through several hypnotic group demonstrations. Her direct, yet affirmative approach in these demonstrations challenged the audience to expand their own understandings of culture and gender, which led to the active participation of audience members throughout her workshop. 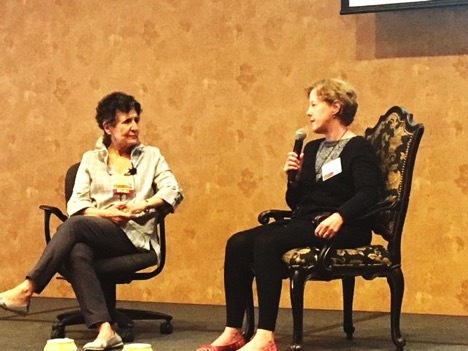 The 47th Annual Hypnosis Advanced Workshop provided participants with the unique opportunity to expand and challenge their own and others’ perceptions and experience of gender and culture as it relates to the field of hypnosis. Dr. Linden, along with the advanced seminar presenters, successfully provided that forum to meet that challenge. Dinner at Spoonriver! Delicious food and wonderful conversation! 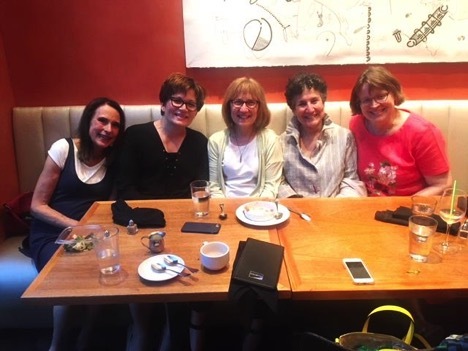 Maureen McNeal, Heather Klein, Delle Jacobs, Julie Linden, & Catherine Russell. When the time is right we will again offer a 2-session (3 hours each) seminar to train small group leaders for the Annual (and future) Workshops. You will learn something didactic about adult students, about the social psychology of small groups, and the methods of small group training. More importantly, you will practice and model the roles and tasks of group leadership. Feedback will come from the members of your group, whom you will get to know well. Qualified graduates of this training will be invited to join the MSCH Faculty and lead at least two small group sessions in forthcoming Annual Introductory Workshops. Participating Faculty receive a reduced-fee registration for the Advanced Workshop when they are not leading small groups for the Introductory Workshop. Use of formal and informal inductions regularly (daily or “most days”) in your practice. Since this training is provided at no cost to prospective small group leaders, it is anticipated and expected that participants will utilize their new teaching skills in service to MSCH by participating regularly as a small group facilitator in forthcoming Annual Workshops. When an appropriate group of prospective participant/trainees has been identified the dates will be set for this training. 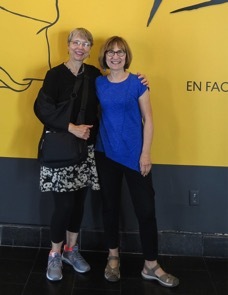 Carol Rogers-Tanner and Delle Jacobs in Montreal. How lucky can a person be? Imagine having been a French teacher many years ago, traveling for the second time in three years to a country where you can practice your rusty French, be sometimes-happily surprised that you are understood, eat delicious food, and explore a city with wonderful museums and beautiful parks. Now imagine that you are getting to travel with a companionable friend, another hypnosis enthusiast who introduces you to her fellow teachers from ASCH (American Society of Clinical Hypnosis), and you get to spend four days learning from and conversing with talented hypnosis practitioners and researchers from around the world. Delle Jacobs (who also has some beloved rusty French) and I had attended the 20th ISH congress in Paris in 2015 and when we learned the next congress in 2018 would be in Montreal, Canada, we started dreaming of this trip. This past August in Montreal, I attended a day long pre-congress workshop with Jeffrey Zeig, Advanced Techniques of Hypnotherapy, getting to practice and talk shop with a gentleman from southern France. The actual congress was structured with two or three keynotes and three hour-and-a-half workshops per day, with about 28 options for each workshop time-slot. Here were some of my favorites. Matthias Mende (Austria): First aid kit for treating anxiety and panic disorder. Jeffrey Lazarus (US): Optimizing motivation and dissolving resistance. Susanna Carolusson (Sweden): Ego state therapy, treating inner conflict, AKA approach-avoidance. Katalin Varga (Hungary): Using powerful words and a healing/calming touch sequence in a medical setting. Jeffrey Zeig, demonstrating his very engaged style even with volunteer whose eyes are closed, unable to see gestures, posture. Jeffrey Lazarus demonstrating his motivational approach, utilizing volunteer’s ratings of the importance of reasons to make a change versus reasons not to do so. I have been having fun, of course, using in my practice things I learned. I’ve reviewed my notes several times since the workshop. Looking over them again for this article, I was reminded of more gems I want to use. What a treat to be able to attend an international conference! If you are ever in a position to do this yourself, go for it. Next ISH congress: Krakow, Poland in 2021. There are several societies in America dedicated to professional hypnosis. The oldest are The Society for Clinical and Experimental Hypnosis (SCEH founded in 1949,) and the American Society for Clinical Hypnosis (ASCH, founded in 1958). 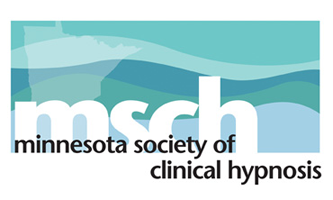 Our own Minnesota Society of Clinical Hypnosis held its 1st meeting in Minneapolis in 1971. An international group was organized in 1959 but did not become the International Society of Hypnosis (ISH) until 1973. 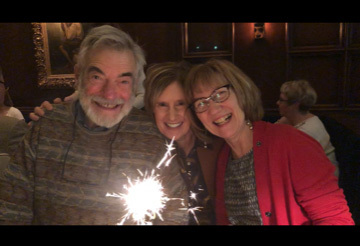 So, in fact, the Minnesota Society of Clinical Hypnosis is officially older than the ISH! But the Societies are intimately interlinked. The names of our members can be found on the rosters and lists of speakers for each of the three others. Research articles written by members of our society show up in the journals and newsletters of others. MSCH members Delle Jacobs, Mark Weisberg, David Alter, Wendy Lemke, Karen Olness, Cheryl Bemel, Dan Kohen, Dave Wark and recent MSCH Past President, Al Clavel repeatedly teach at ASCH national and regional workshops. Many also teach for SCEH and for ISH. And, there is overlap between the organizations at many levels. Karen Olness founded MSCH in 1971, was president of ASCH in 1984–86, SCEH in 1991-93 and ISH in 2003–06. She is, we are all proud to say, the only person to serve in all 3 offices. Al Levitan previously served as MSCH President and ASCH President in 1989-90. Dan Kohen was President of MSCH 1983-1985. David Wark was President of MSCH in 1996, of ASCH 2008-09, and served on the ISH Board of Directors. The connections are strong, and continuing. Some of our members were among the 950 attendees at the ISH meeting that just took place in Montréal, Canada. You can find out more about it at www.ISHhypnosis.org . Our MSCH shining stars: Dan Kohen, MD received the Pierre Janet Award in 2012, and David Wark received it at the most recent meeting in Montréal in August 2018. Here’s what they had to say about their awards, and the many and strong connections between MSCH and ISH. Below are messages from Dan, and then from Dave. 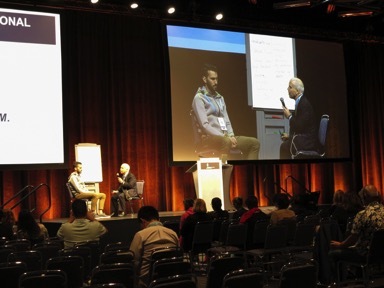 Dan Kohen writes: In August 2018, the International Society of Hypnosis (ISH) organized and implemented the XXI World Congress of Medical and Clinical Hypnosis in Montreal, Quebec, CANADA. Over 950 attendees from 60 countries enjoyed a wonderful congress of workshops, symposia, Plenary Keynote presentations, and the joy and camaraderie of re-connecting with colleagues and friends from around the world. Several MSCH members and faculty attended as in years past, including Carol Rogers-Tanner, Delle Jacobs, and Harriet & Dan Kohen. As the National Pediatric Hypnosis Training Institute (NPHTI) could not have thrived without the unwavering support and sponsorship by MSCH since its inception in 2010, I think it’s appropriate to note that at ISH in 2018 many NPHTI faculty presented workshops to the International Congress in Montreal. These included Drs. Pam Kaiser, Dan Kohen, Leora Kuttner, Jeff Lazarus, Lisa Lombard, and Robert Pendergrast. As one of the main Canadian organizers and planners, Leora Kuttner, also presented one of the Keynote addresses. 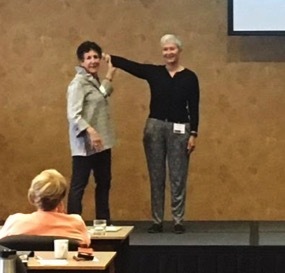 As a NPHTI senior faculty, Leora has also been a well-known friend and colleague of MSCH as an Advanced Workshop guest faculty at our Annual June Workshops and as one of the early Fall Rosenthal Retreat faculty. I have a very clear memory of the 2012 International Congress in Bremen, Germany. At the Banquet and Awards Ceremony, I heard my name called as one of two recipients of the Pierre Janet award that year. I was totally stunned, completely surprised. Somehow, I managed to make my way to the podium for the presentation without stumbling, trying to see through the mist that seemed to have obscured my vision. For those who know me you may be surprised, even shocked, to read that I was indeed speechless (well, almost!). Even now as I regress to recall this, I am humbled by the honor and especially by the knowledge of the collective wisdom of those who have been so honored both before and since that time. I am forever grateful most especially to my long-time dearest friend, colleague in writing and teaching, Karen Olness who invited me to move to Minnesota over 40 years ago and become her partner; and to those first hypnosis teachers in ASCH from whom I learned so much even before coming to Minnesota, Kay Thompson, DDS, Bob Pearson, M.D. who remain significant role models and teachers even now. With that in mind, let me just say that while the 21s International Congress was overall a wonderful opportunity to learn and “bring home,” the clear highlight was the awarding of the Pierre Janet Award for Clinical Excellence to our own, David M. Wark, Ph.D., ABPH. for his longstanding, enduring, and seminal contributions to the practice and teaching of clinical hypnosis. The Pierre Janet Award for Clinical Excellence is given to an awardee whose lifetime of published clinical experience substantially advances the understanding of the uses of hypnosis in obtaining effective results in clinical practice. We in MSCH have all benefited so much from David’s wisdom and leadership over these years. From his scholarly research into the research and conceptualization of our enduring “Spiral Curriculum” (Wark, D. and Kohen, D.P. “The Spiral Curriculum for Hypnosis Workshop Training: The Minnesota Experience” American Journal of Clinical Hypnosis, 45:2, 119-128, October, 2002); the development of training for small group leaders (Wark, D.M. and Kohen, D.P. “Facilitating Facilitators’ Facilitation: Experience with a New Training Model for Teaching Leaders of Hypnosis Practice Groups” American Journal of Clinical Hypnosis 41:1, 75-83, July, 1998) and the implementation of that teaching. I am thrilled for Dave who has been a dear friend and colleague for over 35 years. As a colleague, collaborator, therapist, and mentor, Dave has been quietly effective, thorough, and exceptional as an unassuming leader, teacher, and role model. I can think of no one more appropriately deserving of this high honor of ISH. “Thank you very much for this generous honor. Thinking about today, I recalled my 1st ISH meeting in Toronto, 33 years ago. As a neophyte at the meeting, I was inspired by the amazing Erica Fromm, who opened my eyes to a whole new way of seeing therapy. After returning to the University and the Student Counseling Bureau, I began using posthypnotic suggestions to help college students overcome test anxiety. At the 1988 meeting, in the Hague, my horizons were immensely expanded by the works of Lars-Erik Unestahl and Eva Banyai, who awakened me to the possibilities of hypnosis while alertly engaged and responding, with eyes wide open. Later I was stimulated by the Valencia Model of another colleague, Antonio Capafons. I have searched, researched, extended and clinically applied their notions of alert, active, eyes open hypnosis for anxiety, education and performance issues throughout my career. Please indulge me as I summarize my current thinking about hypnosis. I’ll never have another chance to talk to such an impressive and powerful international audience. I think of hypnosis as a fundamental ability that can be traced back 15.7 billion years ago after the Big Bang, when the earth cooled, and the waters condensed. About that time something new appeared in the oceans. Living globs of molecules, called eukaryotes, had a complex nucleus inside a flexible cell membrane. These early life forms evolved, over millions of years, to become fish, amphibians, reptiles and finally mammals. Their nervous systems evolved in a continuing integration of their basal ganglia, midbrain, and progressively larger forebrain. Early-on, response to food was instinctual— approach and consume. And the response to predator threat was also automatic — fight or flight. Fish may respond by schooling or scattering. A lizard or a monkey might hear a lion’s roar and scramble up a tree. But humans evolved to the next step, they learned to use their large forebrain to inhibit the flight-fight instinct and choose an optimal alternative, or create new, adaptive possibilities. So, an evolved Homo sapien, hearing the same roar might pause, inhibit panic, and choose between throwing a spear, or retreating to the tribe and organizing a lion hunt. The process, to inhibit an automatic, emotion based instinctual response, and then choose or create something different, is the foundation for mindfulness, cognitive behavior control, and hypnosis. I have come to believe that this evolved process is brain-based, researchable, learnable, teachable and, most important, clinically applicable. As therapists, we help people gain control of their evolved automatic responses, and choose or create a better way of being. During my career, I have been guided and stimulated and mentored by many of you. I especially want to recognize Karen Olness, Julie Linden, my special friends, Dan Kohen and David Alter, and the myriad of colleagues who are members, officers and staff of ISH, of the American Society of Clinical Hypnosis, the Society of Clinical and Experimental Hypnosis, NPHTI, and of my home team, The Minnesota Society of Clinical Hypnosis. You know who you are, but maybe not how much I treasure you. In closing, congratulations to Dave Wark for his 2018 award and to Dan Kohen for his 2012 award. MSCH values the wisdom of our seasoned luminaries and treasures their ongoing contributions generosity. 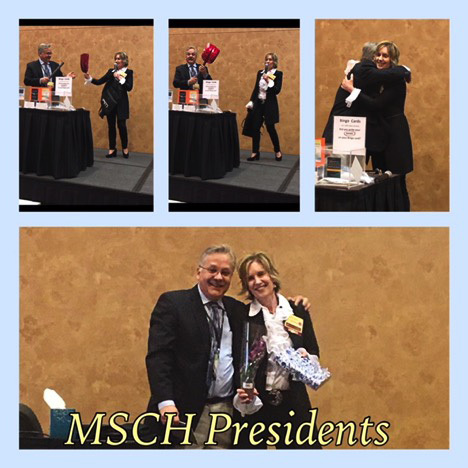 MSCH would not be the well-known shining ASCH affiliate without our founders, and we are forever grateful. September’s MSCH workshop, Getting Better at Crafting Suggestions, focused on key fundamentals about suggestions and two specific strategies to help clinicians generate suggestions without relying on scripts. 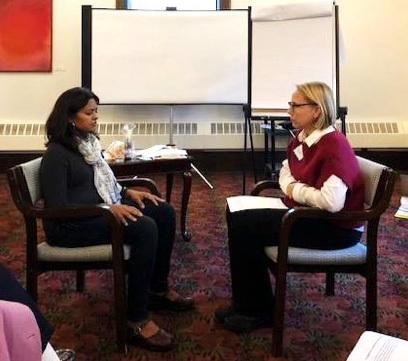 The workshop was designed for novice as well as veteran clinical hypnosis practitioners, and my hope was to offer useful, practical tools to enable quick generation of suggestions relevant to patient’s treatment goals. After some exercises to loosen up our voices and get us ready to experiment, I started with a key point: as clinicians, we offer suggestions to our patients all the time, and we did so before we became practitioners of hypnosis. Hypnotic suggestions derive their increased power from the permissive and persuasive language as well as the rhetorical strategies that characterize clinical hypnosis. With that as our foundation, I went on to review the characteristics of direct, indirect and post-hypnotic suggestions. A four-step approach to help clinicians generate suggestions was outlined, and the group practiced generating suggestions in response to hypothetical cases. Generate HYPNOTIC SUGGESTIONS that follow from the alleviators. The second tool offered was designed to foster patient’s hypnotic exploration of a goal, impediment, alleviator, self, other, and so forth that is not yet fully understood. This tool, which I call Hypnotic Navigation, enables patients to experience something from a different perspective and allows for new understandings and insights to emerge organically. It has the additional benefit of allowing clinicians to work effectively with patient experiences, states or goals that patients may not wish to fully disclose to the clinician. The suggestions are all various ways to direct a patient’s attention to a different perspective or vantage point on a concrete expression of the focus of their exploration. Examples of Hypnotic Navigation include suggestions of: Spatial Proximity (near, far), Time (past, now, future), Size (bigger, smaller), and Orientation (up, down; deep, shallow; inside, outside; left, right; over, under) to the problem. A participant graciously offered to participate in a demonstration of Hypnotic Navigation. With only minimal disclosure about the nature of her concern, she was offered suggestions to explore. She reported a beneficial experience, including a new perspective on what the real issue was. I was privileged to join with my colleagues in a morning of some laughter and silliness, even more learning, and a sharing of ideas about suggestions and healing using hypnosis. The opiate prescription crisis continues to be a trending topic in today’s news. Have you read Drug Dealer, MD by Anna Lembke? You may have watched the recent segment on 60 minutes, “Who’s Responsible for the Opioid Epidemic? : Doctors or Pharmaceutical Companies?” Well, the search for pain relief (acute, chronic, or otherwise) is very real and in a society that looks for a quick fix, the tendency to obtain the “magic pill” is all the more real. 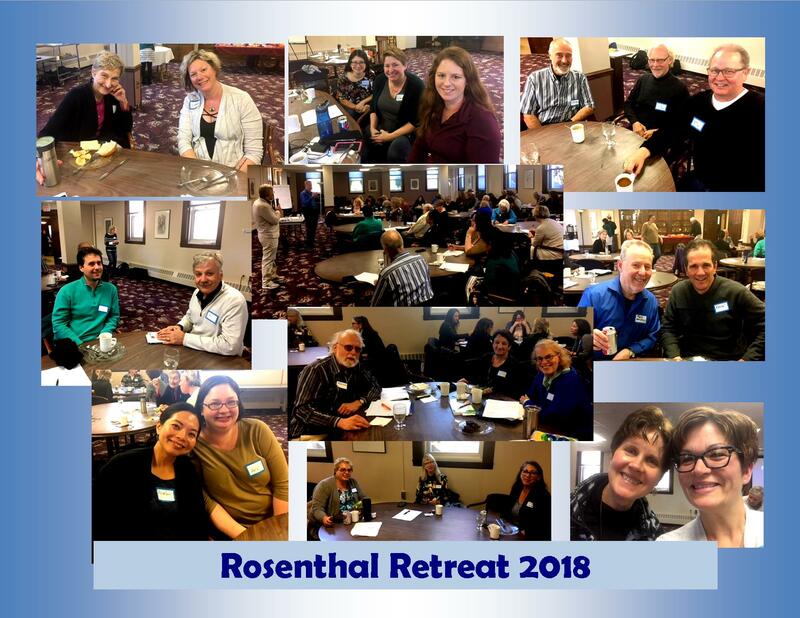 This year’s Rosenthal Retreat was timely. On Sunday, October 21st, Mark Weisberg, PhD, ABPP and Al Clavel Jr, MD shared their passion and expertise on taking a proactive response to this problem. They promote partnering with patients/clients as they begin to reconnect mind and body (for some it may be the first time in their lives) while they slowly wean off of opiate medications. The so called “magic pill” is keeping patients/clients in a dissociated state and maintaining the pain. 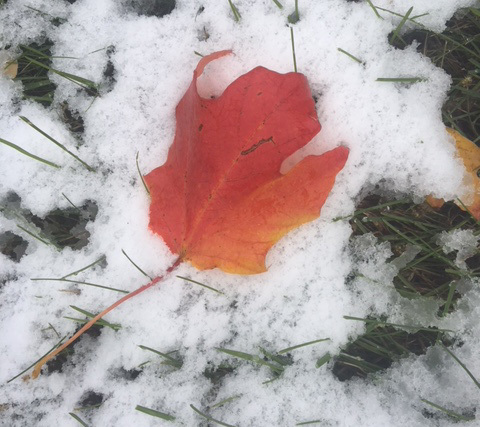 As healing practitioners, we desire to offer additional tools/options that do not come in the form of a pill and to partner with patients/clients to strengthen their resiliency. Working with the body’s desire to move toward healing while walking alongside patients/clients as they navigate unfamiliar territory allows us to support their internal skills rather than using pills. We hold space that creates a sense of “with-ness.” They are not alone. Together, we bring awareness to somatic sensations; educate about the autonomic nervous system; reduce dissociation; decrease the intensity, frequency, and intrusiveness of pain; connect with patients’/clients’ internal resources for self-soothing; and encourage engagement in daily life. Through demonstrations, stories, and metaphor, Mark and Al shared hypnotic techniques that with repetition and training can slowly change the brain through neuroplasticity. For example, noticing one’s breath, leaning slightly forward while resting your forearms on your legs, noticing the stretch in the lower back and oscillating between noticing the breath and stretch. Close the experience with returning to the breath. Along with other notable researchers, such as Peter Levine, Francine Shapiro, and Stephen Porges, Bessel Van der Kolk said it best, “The body keeps the score.” In addition, the MSCH community continues to be rewarded with the expertise of Al Clavel and Mark Weisberg. Many thanks to Mark and Al for their passion, enthusiasm and continued support of MSCH. 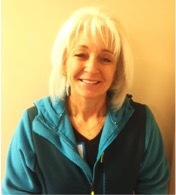 Gail Yost, MA, LMFT is a Licensed Marriage and Family Therapist. Gail is certified in Clinical Hypnosis, EMDR, and Brainspotting. She works with individuals, couples, and families affected by trauma and pain. 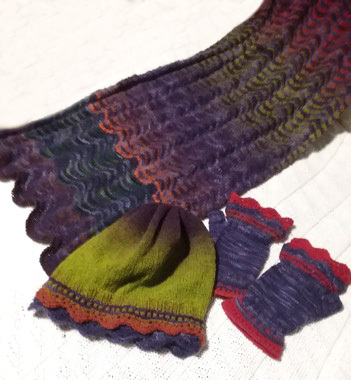 Pictured are the shawl & matching hat & mittens I knitted with my friend. Behind it is the blanket I knitted while grandpa was alive. Insert, wrap, slide; insert, wrap, slide; insert, wrap, slide. The rhythm of the stitches. The breath with every stitch. The feel of the wooden needles and the texture of the yarn. Insert, wrap, slide; insert, wrap, slide. The conversation about our kids while I knit with a friend. The satisfaction of seeing the pattern emerge from the stitches. The feel of the weight of the yarn when I wear the shawl. Insert, wrap, slide; insert, wrap slide; insert, wrap, slide. Learning new ideas as I listening to a training. Taking in the conversation at a department meeting. Filling time while I wait for an appointment. Stitch, breathe, stitch, breathe, stitch breathe. And I carry the memory of grandpa when I feel the weight of the blanket that I knitted while he was hospitalized. My friend Carmen, whom I taught to knit, the matching shawls that we did together. The mittens I made when I was first learning. All these carry the relationships and memories. Grandpa isn’t so far away now, though he died in 2005. Carmen in April 2016. Karin who taught me to make mittens, she has moved on. Stitch, breathe, stitch, breathe, stitch breathe. A few quiet moments at the end of the day, tucking in the ends of the threads of my conversations, my work, my family. Catherine Russell practices at Loring Park and her clinical interests include Peri and Post Partum Mood Disorders, Childhood Death, Co-occurring Chemical Dependency and Mental Health Issues, Refugee Trauma, PTSD. 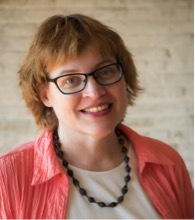 She draws from training in EMDR and Hypnosis as tools for her work with clients and she provides supervision at the University of Minnesota School of Social Work for interns and supervision for the Board of Social work. She enjoys singing in a community choir and knitting and is the “fix-it” at home, specializing in electrical and plumbing repairs at home. small groups with a high faculty to trainee ratio.